EK Water Blocks, Ljubljana based premium liquid cooling gear manufacturer, is proud to introduce a new line of pump tops and reservoirs – The Revo series! EK-XTOP Revo D5 is a high performance aftermarket pump volute / body for Laing D5 series water pumps. If offers increased hydraulic performance (up to 15%) compared to original factory top. 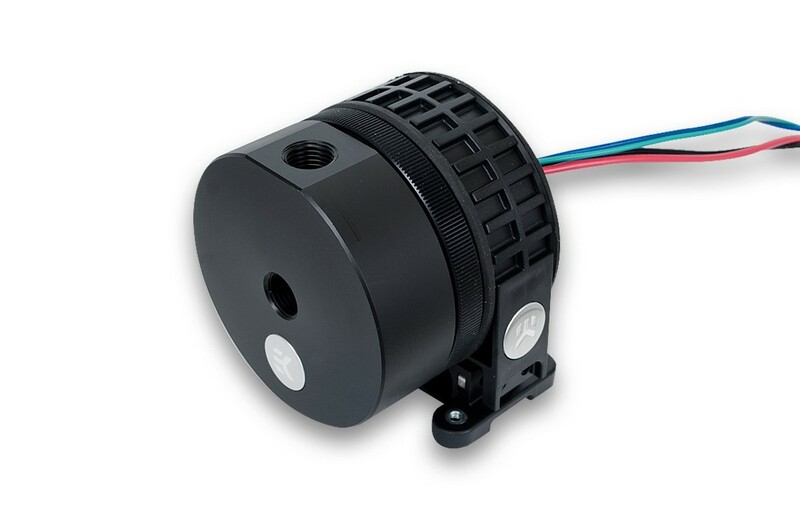 The biggest advantage over the previous pump top models that Revo series introduces, is a new rounded design. 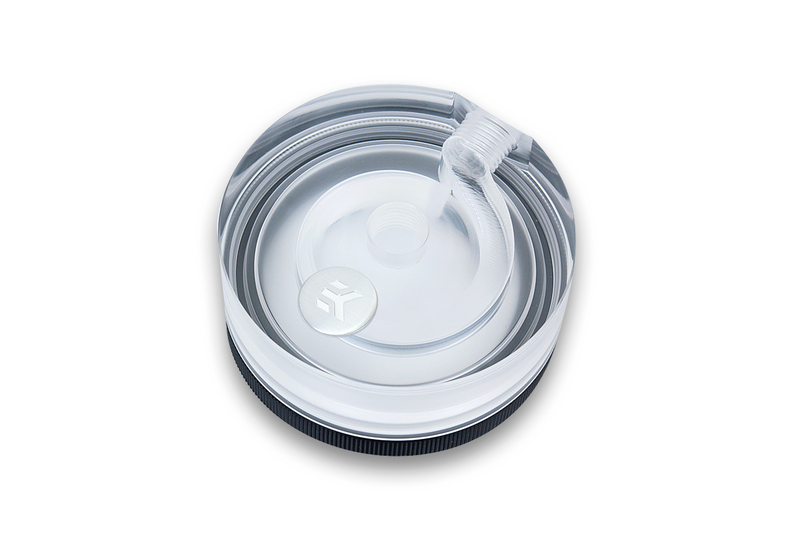 Special rubber shock absorbers inside the holder are used for surrounding the pump for the purpose of eliminating vibrations. There is a single inlet- (suction) port on top to feed the pump with water and outlet port (pressure) on the side of the unit. Both ports are standard G1/4 threaded for installing barbs or fittings. 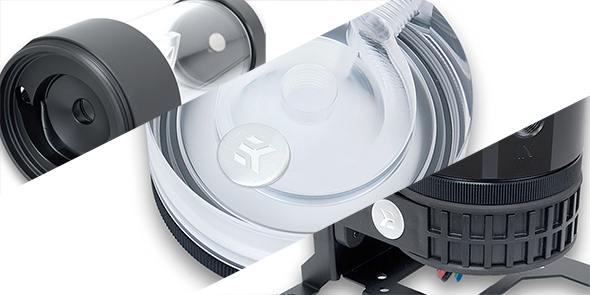 Liquid cooling enthusiasts and PC builders will benefit from the circular design as the top can be rotated inside the holder for 360 degrees. This feature allows for infinite possibilities when determining the outlet port position and tube routing. 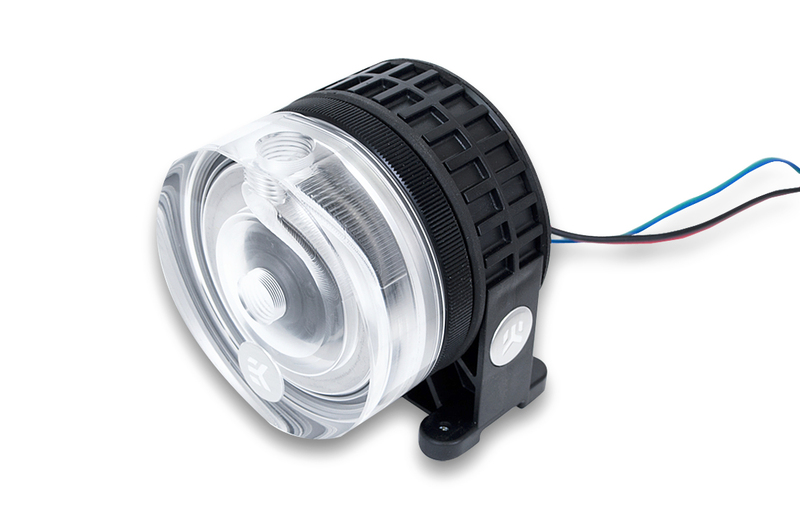 EK-XTOP Revo D5 comes in two different variations, Acetal (made of quality POM Acetal meterial) and Plexi (high quality Acrylic material) – with or without the included pump. 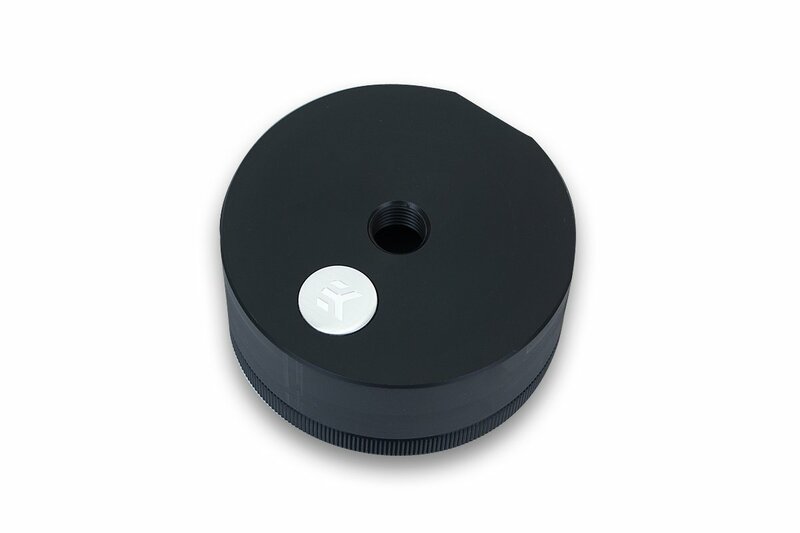 The tightening nut is made from CNC machined aluminum and mounting clamp is made from injection moulded ABS. 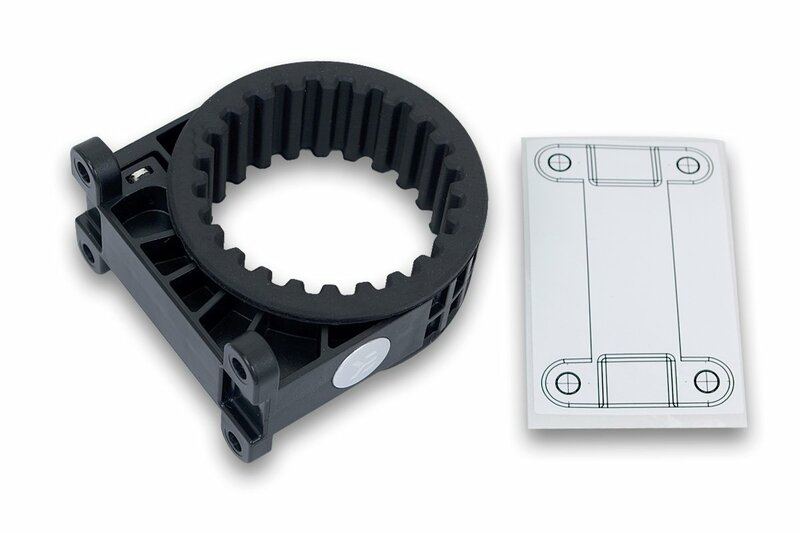 Mounting clip with rubber insert (left) and self-adhesive mounting hole pattern sticker (right). 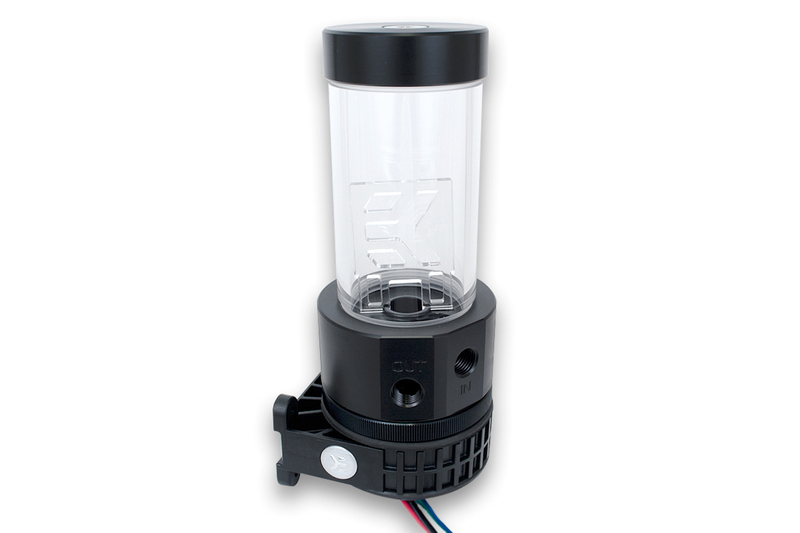 EK-XRES Revo D5 comes as a standalone reservoir unit or as a reservoir & pump combo. 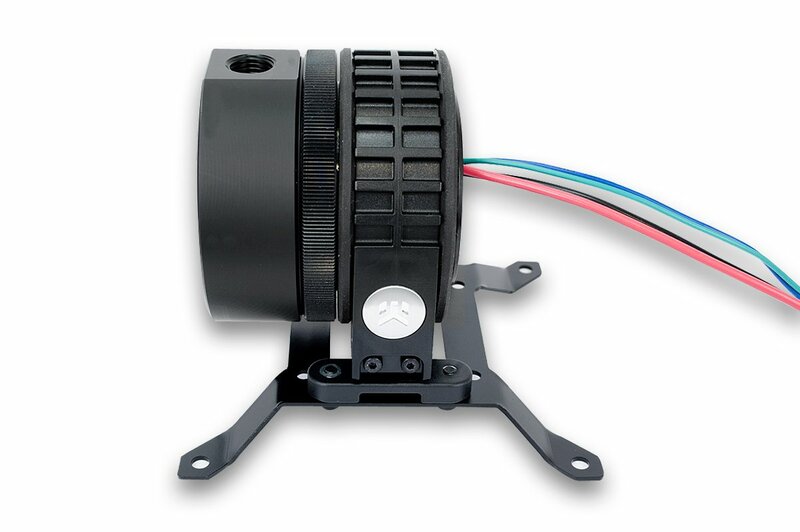 When purchasing the reservoir / pump combo, as the name suggests, customers get market-proven Laing D5 PWM water pump and with EK-XRES Revo D5 up to 15% increased hydraulic performance. 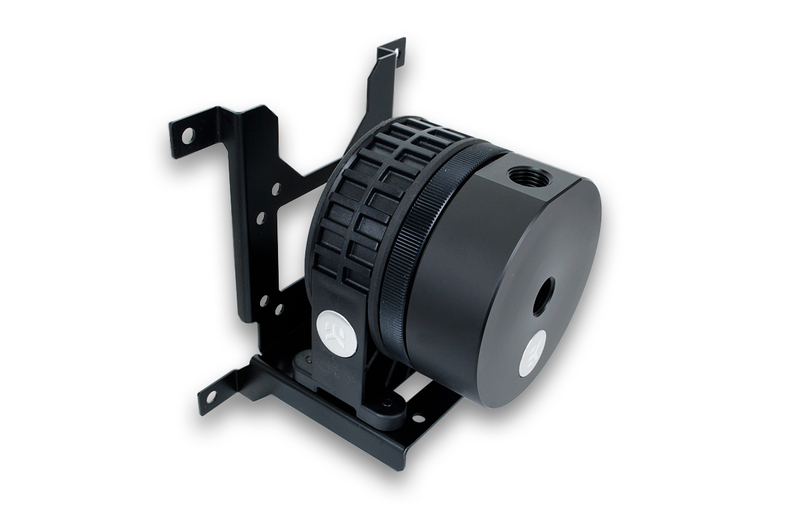 As with the EK-XTOP Revo, EK-XRES Revo D5 features a fully rounded design thus offering greater usability, allowing installation at any angle within 360 degrees of rotation. Special rubber shock absorber is used to de-couple the the main pump body from the mounting clip for silent operation, free of vibration induced noise. 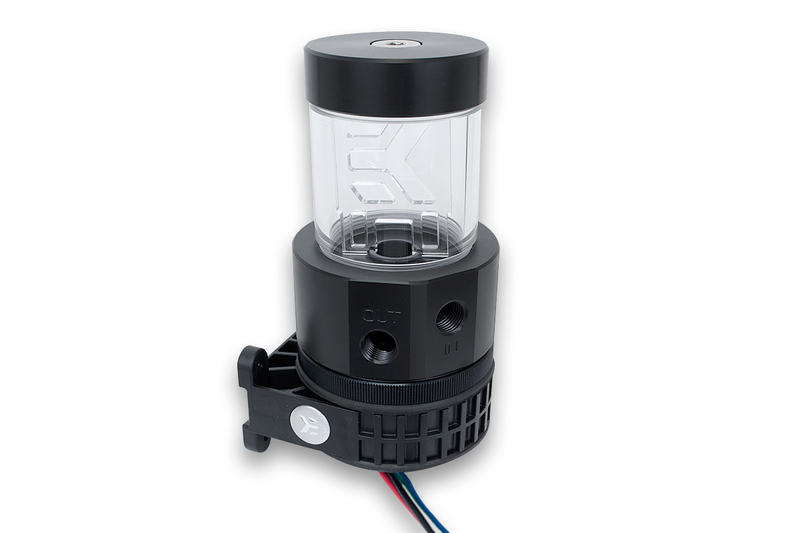 EK-XRES Revo D5 with included pump comes preinstalled with anti-cyclone insert, with additional PU anti-vortex foam and 41mm EK-HD Tube enclosed for reducing vortex and air bleeding problems. Reservoir tube is made of quality acrylic material, while the reservoir bottom/pump top is made of quality POM Acetal material. 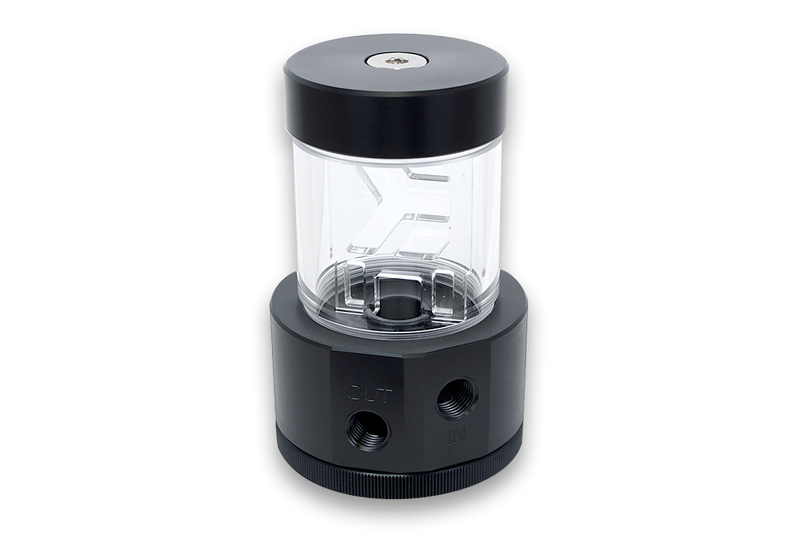 Revo series of pump tops and reservoirs are made in Slovenia, Europe and are readily available for purchase through EK Webshop and Partner Reseller Network. MSR prices with included VAT are in the table below.